The adjective 'medieval' is now a synonym for superstition and ignorance. Yet without the work of medieval scholars there could have been no Galileo, no Newton and no Scientific Revolution. 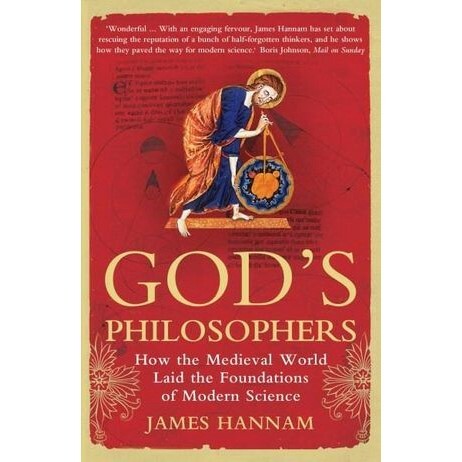 In "God's Philosophers", James Hannam traces the neglected roots of modern science in the medieval world. He debunks many of the myths about the Middle Ages, showing that medieval people did not think the earth was flat, nor did Columbus 'prove' that it is a sphere. Contrary to common belief, the Inquisition burnt nobody for their science, nor was Copernicus afraid of persecution. No Pope tried to ban human dissection or the number zero. On the contrary, as Hannam reveals, the Middle Ages gave rise to staggering achievements in both science and technology: for instance, spectacles and the mechanical clock were both invented in thirteenth-century Europe. Ideas from the Far East, like printing, gunpowder and the compass, were taken further by Europeans than the Chinese had imagined possible. The compass helped Columbus to discover the New World in 1492 while printing allowed an incredible 20 million books to be produced in the first 50 years after Gutenberg published his Bible in 1455. And Hannam argues that scientific progress was often made thanks to, rather than in spite of, the influence of Christianity. Charting an epic journey through six centuries of history, "God's Philosophers" brings back to light the discoveries of neglected geniuses like John Buridan, Nicole Oresme and Thomas Bradwardine, as well as putting into context the contributions of more familiar figures like Roger Bacon, William of Ockham and St Thomas Aquinas. Besides being a thrilling history of a period of surprising invention and innovation, "God's Philosophers" reveals the debt modern science and technology owe to the supposedly 'dark' ages of medieval Europe.